13 When you were dead in your sins and in the uncircumcision of your flesh, God made you alive with Christ. He forgave us all our sins, 14 having canceled the charge of our legal indebtedness, which stood against us and condemned us; he has taken it away, nailing it to the cross. 15 And having disarmed the powers and authorities, he made a public spectacle of them, triumphing over them by the cross..
Christ triumphed over the principalities and powers of this word. But the way he triumphed was through the cross. When Jesus was killed on the cross, the powers of this world gained the upper hand — but they only gained the upper hand in the world’s view. Everyone thought the principalities and powers had won. Jesus was killed. The hope for a new Israel was shattered. Imagine you were one of the disciples. (Don’t fool yourself into thinking you would’ve “figured” it out. That’s nothing more than spiritual pride…spiritual pride masking spiritual ignorance.) You’ve followed a man from Galilee around Palestine, and this man has made spectacular claims about himself. A few days before his death, he had been welcomed into Jerusalem as a king. Unexpectedly, he is arrested and crucified. You had expected him to conquer, but he was conquered. This, then, is how it is with loftiness and lowliness. The true Christian’s abasement is not sheer abasement; it is only a depiction of loftiness, but a depiction in this world, where depiction must appear inversely as lowliness and absement. The star truly is high in the sky, is just as high in the sky although, seen in the sea, it seems to lie far under the earth. 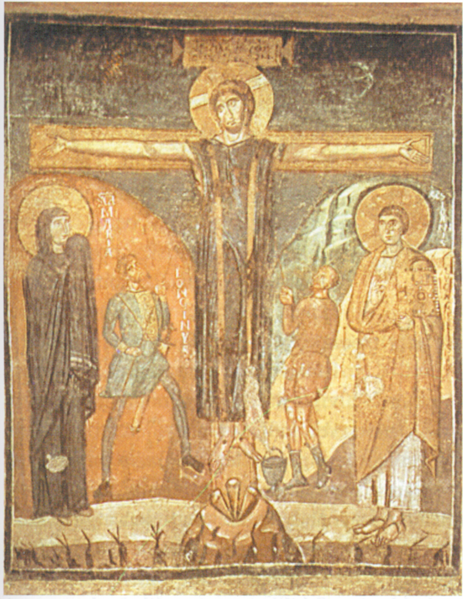 Likewise, to be a Christian is the highest elevation, even though in this world’s depiction it must appear as the deepest abasement….As soon as you take away the world, that muddy element that confuses with its depiction, as soon as the Christian dies, he is on high, where he already was before, but which could not be seen here by the world, no more than anyone who could not raise his head and thus could see only the star deep down at the bottom of the sea could have the idea that it actually is on high. Jesus, as he hung on the cross, looked low in the world’s view, but was the most powerful anyone has ever been on the face of this earth. He triumphed over the powers of this world in the form of heaven’s power. He didn’t triumph over the world in the form of worldly power, but in the form of heaven’s power. Yet, in two thousand years of Christianity, have Christians learned that? How often do we try to triumph over Satan using the powers of this world? We’ll defeat evil and immorality in the U.S. by getting control of the government, right? Of course, I’m sure that, if Jesus had lived in a democracy like ours, he would have triumphed over the world by forming a first-century Christian Coalition, or a first-century Moral Majority.